Rent directly from a private local owner who lives on island instead of a management company. 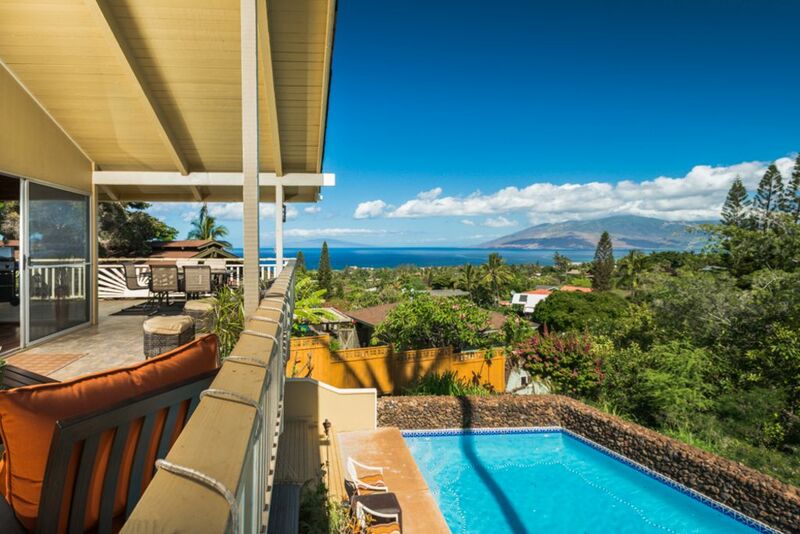 Come stay with us here in sunny south Maui at our beautiful, lovingly remodeled ocean view home with private pool. There are amazing ocean views from almost all rooms in the house and the wrap around covered deck is perfect for indoor/outdoor style island living. The crystal clear all tiled pool is for your private use with no other rentals on the property (most Maui Meadows homes have a cottage). Several beautiful white sand beaches are a short two minute drive away. This home is one of five legal private home rentals in the desired island neighborhood of Maui Meadows. We passed all county regulations and now can share our lovely property with visitors to this special island we call home (Permit #STKM 2013/0005). There are no other buildings on our 1/2 acre land - the private use of our 3 bedroom, 2 bath fully renovated home and pool makes for a memorable vacation. This home even has it's own elliptical trainer with an unparalleled view and pool table for evening entertainment. We are a short two minute drive to the beach, several restaurants and shopping. All children must be able to swim or wear the provided safety gear at all times near the pool. Children must always have adult supervision by the pool. QUIET HOURS ARE FROM 9PM-8AM: Quiet Hours are a County requirement for licensed vacation rental homes like this one. The SUNNY SOUTH MAUI VACATION HOME is located in a residential neighborhood and guests must be aware and respectful of neighboring properties. Please be sure that ALL the members of your group are aware of the quiet hours. We want you to have a fantastic and relaxing time on Maui- we promise we won't impose many rules on you, but we respectfully ask that guests abide by the quiet hours. GROUP GATHERING RESTRICTIONS: Only registered guests are allowed on property. No wedding parties or large family gatherings allowed. We have lived on Maui for the last 18 years. Steve is a firefighter with the county of Maui and Tamara now runs our vacation rental business. Our two children were born here on Maui but have roots in Canada where Tamara grew up, Steve lived for years and grandparents reside. We also have studios and one bedroom condos in Kihei and Wailea that we rent to vacationers. This is a legal, permitted vacation rental home in a unique residential neighborhood that has been known for renting to visitors in the past but was previously mainly illegal to do so. There are no other buildings on this property like most Maui Meadows homes so it is completely private. We currently live just a few minutes away and personally take care of all our guests needs. The advantage of an on-island owner who self manages is a property you can be sure is well taken care of. Steve and Tamara's home is extreamly comfortable, clean and well maintained. The views from the deck are fabulous! We look forward to returning Kihei and if this rental is available we will surely stay here. This property is beautiful and fantastic! Steve's and Tamara's Wailea Home is fabulous. It is furnished with all the amenities, including beach towels, kitchen utensils, and comfortable beds. We came, for 10 days, to celebrate our 40th anniversary with our son and 7 and 11 year-old granddaughters. We could have made a vacation just staying at the house with the pool, hot tub, pool/ping pong table. They also have movies, books and board games. The property is located near many activities (i.e., Old Lahaina Luau, Atlantis Submarine adventure, Road to Hana, Haleakala National Park, whale watching, etc. ), which makes it very convenient. The neighborhood is quiet, quiet, quiet. Just what we were looking for. The views, from the home's balcony, are stunning. You can see whales as well as beautiful sunsets. We highly recommend this beautiful property for your next vacation, and hope to visit again in the future. The house was everything it was pictured to be., we'll maintained and clean. My family and I were a group of 7 and it was large enough to accommodate us all. I like the open kitchen concept that enables you to cook and still interact. The balconies and back patio for most of the rooms are stupendous. The views are gorgeous and the hot tub and washer/dryer is an added bonus. The house is about 25-30 minutes away from most of the chain stores but 10 minutes away from the nearest grocery store. The views driving in the area are breath taking. We loved this house. It was spacious and comfortable. Private and quiet yet close to restaurants, shopping and beaches. The pool was so much fun in the afternoon and again at night. Every night we relaxed in the hot tub. The morning I spent on the deck with a cup of coffee listening to the birds. Each evening I was back on the deck with a glass of wine watching the sunset over the ocean. This was a special house for a very special trip. We loved staying at Steve and Tamara's house. The house is spacious, tastefully decorated and comfortable. The view is amazing. I loved having coffee on the deck every morning and a glass of wine on the deck while watching the sun set over the ocean. The pool and hot tub were a plus. It was close to many wonderful beaches, shops and restaurants. I would highly recommend this house for anyone looking for a place to stay in Maui. 6 of us stayed a week and after long days of sightseeing and beech looked forward to our return to this fantastic home. Pool is definitely underrated in pictures. It was perfect size and well kept. All amenities worked great. It’s a 4 minute drive down to the main highway and offers breathtaking views of the island. South Maui and Wailea are known for amazing weather all year long and also for the many beautiful long white sand beaches. Maui Meadows is a special neighborhood with all 1/2 acre lots where one can truly feel what it is like to live in paradise.